Honeywell has completed the dredging and capping of Onondaga Lake. The result of more than two decades and millions of hours of intensive effort, the project was completed through an unwavering focus on sound science, technical excellence, community engagement, sustainable practices, and a commitment to health and safety. Habitat restoration, a major focus of the cleanup, continues in 2017, as does Honeywell’s commitment to encouraging community volunteers to become environmental stewards. Working under the supervision of the New York State Department of Environmental Conservation (DEC) and the U.S. Environmental Protection Agency (EPA), Honeywell worked with national and local experts, including the State University of New York College of Environmental Science and Forestry (SUNY-ESF), Syracuse University and Upstate Freshwater Institute. About 500 Central New York workers have been an integral part of the cleanup, providing expertise, essential resources, dedication, and hard work. Lake dredging was finished in November 2014, a year ahead of schedule. More than 3 million cubic yards of material consisting primarily of sand, activated carbon, and stone was used to cap 475 acres of the lake bottom, providing a new habitat layer. To date, 74 acres of wetlands have been created or enhanced and nearly 600,000 native plants, trees, and shrubs now provide diverse habitat for more than 230 wildlife species. Geddes Brook, LCP wetlands, and Nine Mile Creek are remediated and restored, creating a green corridor from the lake to upland areas. According to the New York State Department of Health, water quality in the northern two-thirds of Onondaga Lake has achieved public health criteria for swimming. DEC has documented 65 species of fish, up from nine to 12 counted in the 1970s. The aquatic plant community has expanded from less than 12 percent of shallow-water lake areas to about 80 percent, according to SUNY-ESF. Upstate Freshwater Institute has confirmed that methylmercury (the form of mercury that accumulates in fish and organisms) in deep-water portions has decreased 98 percent since 2009. Concentrations of dissolved mercury are significantly lower in surface water samples. Levels of methylmercury have declined dramatically in both lake water and zooplankton. The decline is expected to contribute to lower mercury concentrations in fish. Natural recovery in the lake is progressing faster than predicted. The cleanup, together with upgrades made by Onondaga County to its wastewater treatment plant and the county’s Save the Rain program, has resulted in the best water quality in more than 100 years. 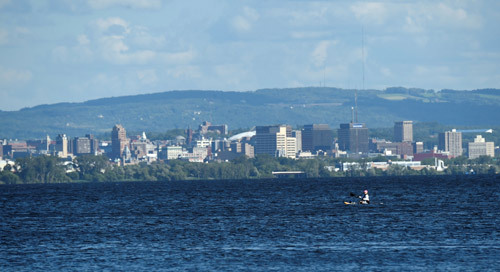 The Central New York community has played a key role in the efforts to clean up Onondaga Lake. More than 1,200 community meetings, presentations, and tours have been held since 2004. The Onondaga Lake Community Participation Working Group has met to foster community input and provide ways for the public to receive information. Designed and built by Honeywell, the Onondaga Lake Visitors Center has hosted more than 14,000 people, providing the public with access to the significant work taking place. More than 650 community members have joined the Onondaga Lake Conservation Corps, which was founded in 2012 and seeks to inspire environmental stewardship through a hands-on, experience-based program. Citizens and organizations have the opportunity to participate in activities that help restore and sustain Onondaga Lake and its value as an Important Bird Area. In 2015, a symbolic lake swim drew hundreds of community members. Thousands of people attended the inaugural Onondaga Cup and Lakefest in July 2016, including Governor Cuomo. View a fact sheet about the end of dredging and capping. Watch videos and view photographs of the Onondaga Lake cleanup. 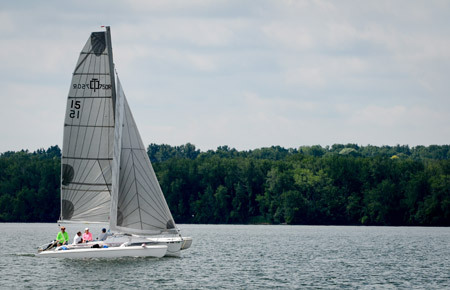 Read news about the Onondaga Lake cleanup. Individuals interested in more information on the Onondaga Lake cleanup can contact Honeywell at 315-552-9784 or visit www.lakecleanup.com.